An evening of two innovative women in music on the occasion of International Women’s Day. Chinese-American composer Bun-Ching Lam presents premieres of her new works “Five Songs From Cold Mountain” (for baritone, flute, viola & harp) and “…Like Water” (for violin, piano & percussion). 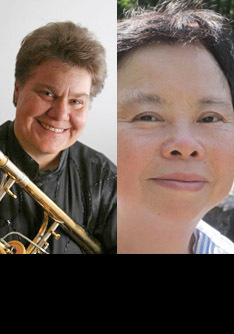 Trombonist Monique Buzzarté presents the world premiere of “Tracing” (2011) by Frances White for trombone and electronic sound, which was funded by the MAP Fund for Creative Arts Performance Projects. The program also includes new works composed for Buzzarté by Sorrel Hays, Alice Shields, Buzzarté herself, and Pauline OlivAneros, with pianist Sarah Cahill.